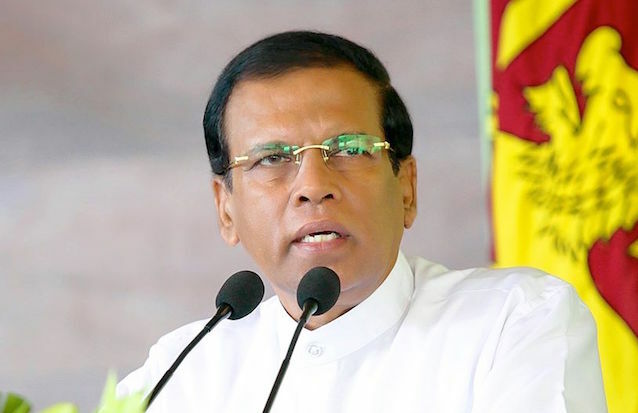 President Maithripala Sirisena this week justified instances where teachers and principals lose their temper and beat students, while urging parents of students to rethink and reevaluate a situation before going to the police and to courts seeking action against such teachers. Speaking at the ‘Guru Prathibha Pranama Ulela’ teacher commemoration event on Wednesday at the Nelum Pokuna, Sirisena said, “human rights, fundamental rights, freedom, democracy are beautiful words and are also necessities for society. But, these are granted to improve society, and to define society and not to be misused,” he said. “But what has happened today? when a teacher gives a child a small knock, canes the child, the child complaints to the parents, and the parents go to police and then to courts. But as fathers we know how difficult it is to bring up children. As a father I know what a difficult task this is,” Sirisena said. “Then imagine how difficult it is for a teacher to manage a classroom full of 40 to 50 students, and equally how difficult it is for a principal to manage a school that has several thousand students,” Sirisena said. The President said that it was important for everyone to understand that even teachers and principals are average human beings. “They also have flesh, blood and veins running through them and there are times they too can lose their temper. So as much as freedom and rights are important, even parents need to see things from the perspective of a teacher,” Sirisena said. He also recalled how he was severely caned when he was in school because the Principal mistook him as the child who was behind a classroom ruckus. “The principal took me to his office, and caned me till the cane broke. While he was caning me I was wondering why he was hitting me. But even if I went home and told my parents that I was caned, they would have taken the principal’s side saying I was caned because I was up to no good,” Sirisena added. He was caned by Mahinda because he is up to no good. He cant tell the country that. SL president seems to believe that 1960s teaching methods are still the best and openly promote it, how sad !! How unfortunate citizens lead by this president !! In SL there are more sadists than masochists and the imbalance needs to be redressed. (Helen of Greece and Emperror Chandragupta in his own right over Alexander the Great )- First Confession after the meeting of West and East in grandeur unsurpassed in human history- Buddha Foot Print. Greek and Latin accounts, Chandragupta is known as Sandrokyptos, Sandrokottos or Androcottus. Chandragupta Maurya (born c. 340 BCE, ruled c. 320 BCE – 298 BCE) was the founder of the Maurya Empire. Chandragupta gave up his throne towards the end of his life and became an ascetic under the Jain saint Bhadrabahu, migrating south with them and ending his days in sallekhana at Shravanabelagola, in present day Karnataka; though fifth-century inscriptions in the area support the concept of a larger southern migration around that time. A small temple marks the cave (Bhadrabahu Cave) where he is said to have died by fasting. Sigiriya? ?Why are the fresco babes without tops while at it’s original HariSena babes cover their Breast with jewels?? I give you due credit for being progressive on many fronts. However, on this one your views are totally disappointing. Physical punishment by teachers in schools is nothing but abuse of innocent kids. It also instills the notion that violence is OK to get your way. Kids learn from their teachers. Is that why our whole society so bogged down by violence. Just look at the Police, the military or even general public. All love violence. Non-violence starts from school. Violence is not OK not by anyone. Including by teachers. Specially not by teachers. Please seek better advise on this issue from more learned people. I thought you had learned a thing or two. After that debacle caused by your comments about the Enrique Iglesias Concert in Colombo. Apparently you have not learned thing. It is a pretty big leap from Polonnaruwa to Colombo 7. I agree with most of your observations, but I think that you ought to listen more carefully to what Maithri actually says. Teachers should never get violent; I agree. Violence does beget violence, and there is far too much of it in Sri Lanka. What Maithri has commented on is the OVERreaction when something happens in a school. There are, indeed, many monsters in schools, and they should be eliminated. I know that there are paedophiles and such like who should be jailed in addition to being sacked. As for the Iglesias concert comments: yes, Maithri did not realise how much has changed, and that HE, as President, has to be more careful. I think that he has learned a thing or two. He’s NOT repeating mistakes. I rather like his honest and spontaneous responses, though. Preferable to the sanitised comments that excuse everything. On the other hand, I share the frustration of most with the slow pace at which we are bringing criminals to book. At times it looks as though there is mutual back-scratching, and we’re taking much too long dismantling the Police State – especially in the North. We seem afraid to acknowledge the outrages that were directed at minority people. So, please listen carefully. I must acknowledge that my own Sinhala is sometimes a bit niggardly to fully understand what he says, and I’m not necessarily ashamed to say that my command of my mother tongue is sometimes inadequate. Perhaps Polonnaruwa is worth knowing, while Colombo 7 is not! Would I seem muddle-headed to you if I re-iterate my agreement with ALL of your first four paragraphs. It’s that bit of contempt for the indigenous that I have reservations about. The country does NOT belong to the English-speaking minority. It is desperately important that the majority, who have no way of learning the foreign language that we are so much at home with, are not made to feel second class citizens. And remember that there ARE non-English using Tamils as well. The comment below this was actually posted before ANY had appeared. But below that you have a response by me to “Brian”. Both have received many red thumbs-down responses; oh, well, never mind! Better get that whip out and start using it at home dear President. We all have a heart for The Mark of the Beast? Mi_thuna needs to oscillate my metallic sonatas!! Common sense. Now let’s have some hypocrites making out that this decent man is a monster! I’ve been a teacher myself, and I know that what he says is true. and he says that there is another side to this. Yes, there are monsters, sadists, perverts and predators. I think this a good speech to make to teachers, . . . but the point is the man is a politician, in the most elevated place in this nation of 22 million people. What is disappointing is that he hasn’t disciplined some of the rogues in his party. Quite the contrary, in fact: re-recruiting the the likes of S.B. Dissanayake. On that, and not disciplining his younger siblings, he is to blame. The children have been brought up, not without fault, but brought up well. All that is well; now, Maithri, get on with governing the country more firmly, and may be fewer foreign jaunts. On the whole, you pass! Maithri must realize that times have changed from the time he was a schoolboy and many things what were acceptable more than half a century ago are NOT acceptable today. There are many numbers of teachers whose methods do NOT include sadistic punishments of children and for the President to defend such individuals is beyond the pale. You mean, now because of politics, criminal have more rights than the society. Student has more rights than the teacher who disciplines him. You cn not generalise every thing toegether. You need to consider case by case. Nobody could have corrected him even if the teacher had whipped him with thrukkaivaal! What actually happened was your brother was axed in true cultural style of the village of Sri Lanka- 80% live in villages. When the public mission schools were taken over in came new sinhal masters from the south and `they lynched anyone who got less than 40% in Sinhala- that is your vulture eaten culture. while these schools had masters of discipline with controlled spanking. You export Victoria’s Secret but ban knickers bras being flung in bliss- music food for thought. Depota Naya has come out of ගුහාවකි Benaya. What do you expect from a 3rd class uneducated rat!? I think I know what you are implying, and why you are saying it. My comment above reveals that I have been a teacher. Does that mean that I am educated? I’m old now, and many a time I’ve been told that I can’t really be educated because I’ve been a village school master. This is a major problem facing us; the low expectations from guys who are villagers. I know that you will, perhaps, grant me the status of being “educated” because I know that I use the language of the Anglo-Saxons flawlessly. Boastful? Anyway, what we imagine is that a man who speaks Sinhala much better than we speak English is still “uneducated”. I love to listen to Maithri speaking Sinhala; he does it so well and displays such a breadth of knowledge that I am forced to acknowledge him to be a more gifted man than I. However, he would have had little English in childhood and so he is not a fluent speaker of English, although I’m pretty sure that he must be able to read. Once more, my conjecture is that most of his reading would be in Sinhala, (and Russian?) including quite a lot of translated works. You will find evidence that comments on that article started getting blocked about five weeks ago, but I got one in this morning. Why? If you really go in to this, you will be shocked. Brian, I would greatly appreciate a response from you. I will be able to stomach even something very rude. We can progress only by stating our positions on current and pressing events frankly and honestly. You will realise that I have throughout been very transparent. I don’t think this man understands the term “Human Rights”. In other words, Mr. President, you are still living in the 1950’s. When teachers and principals cause physical and psychological harm to students, YES, parents should file formal complaints with the police. The child should actually receive counselling for the trauma. Just because you are a parent, teacher/principal doesn’t give you the license to beat the *CENSORED* out of children. In-contrast what happens in SL is that the teacher/principal goes into a rage and hammers the students. Just look what happened at the Walasmulla National School recently. One mischievously provocative headline elicits virulent responses from thoughtless men with poisoned pens. That is the story of web offerings in Sri Lanka and those who comment. Sri Lanka passionately wants evil to reign because it is a nation that functions only through fear. It is not yet ready to savour or appreciate relative freedom. I agree absolutely with your first paragraph, dear Justice & Fairplay. It may be that even the second is, unfortunately, justified! These English translations just don’t capture the nuances of Maithri’s comments. In these matters he speaks from his heart, and that is good. Perhaps the “madu waligey” (Sting Ray tail) comments showed that he didn’t realise how much the outlook of the “Westernised” young has changed; his shock was understandable but his “presidential comments” were ill-advised, but these are not huge problems. There is no reason why we should personally approve of every modern aberration; the lowest common denominator seems to prevail. Actually, what he’s said here is quite sensible; I feel that not many actually bothered to listen. Maithri’s language is extremely evocative Sinhalese, difficult to translate. What he says from personal knowledge is balanced, intelligent and reasonable. Readers who understand Sinhalese ought to listen carefully. He does NOT advocate the harsh treatment of children; he’s saying that teachers, too, are human. He contrasts what a teacher occasionally does (and ideally the teacher shouldn’t lose his temper) with the ridiculously exaggerated response of parents. The comments of many readers are far too legalistic. Fortunately, that incident is getting scrtinised; many things of this sort don’t even get mentioned. If we want to comment we have to be more careful to get the details right. good to know that he and i are in the same boat.Then i also may have a chance of being president one day.That master was chasing me round the classroom kicking my bum because of a minor offence of throwing a paper ball at his head when he was writing on the blackboard the usual rubbish which he only can understand. anyway there should be some proportionality in the case of punishment in the classroom just as there is a proportionality in the punishment meted out to people in the courts according to the offence committed.we can’t give carte blanche full powers to teachers to do anything they please to do to students. in sirisena’s case he deserved to be caned because he himself looks like a school principal and the principal would have recognised that and wanted to give him a message that he should not embark on that career.he did him a favour because now he is a president after going into politics. In my case i was merely conveying to the master albeit through a missile that he was not doing his job properly just coming to class and writing on the blackboard to pass the time and then vanishing.i’am sure that the readers will support me when i say that getting about ten kicks on the bum was very harsh. We the Sri Lankan Government ratified it in July 1991. Mr President I am sure you were in parliament at the time! You cannot as a leader claim ignorent! Accountability in Good Governance is a feature that cannot be ignored! This includes accountability to public statements. The problem is with your so called non professional leech advisors who give you information which is for their short benefit. High time you gat proper advisors who are professionally qualified an experience! In the CRC article 28 (2) it specifically states: 2. States Parties shall take all appropriate measures to ensure that school discipline is administered in a manner consistent with the child’s human dignity and in conformity with the present Convention. I think there are two facets in your Ill advised statement. 1. You wanted to indirectly hit at the UN. 2. your advisors thought you Could pitch into the teacher VOTE bank! please note that statesmen look at the future generations I. E children, while politicians think of the next election and the vote! Do you want to go down in history as a Statesman or Vote hungry politician!! Let me reiterate that we still believe on the principle of Yaha Palanaya but not (yet) necessarily persons who need to demonstrate action on Good Governance!! it is a waste of time discussing this clown ! HE does not get it. I do believe that he himself does not understand what he is saying !may be reading a speech written for him. It is a curse we have had a string of idiots governing this country since DB Wijethunge . I include Ranil the longest leader of the opposition and the continuous looser to be head of a party with out walking away from the leadership as any looser does. These are the clueless clowns WE idiots appointed so what are we? This is unbelievable. The President of Sri Lanka is actually advocating the granting of powers to the teaching staff of schools to verbally and physically abuse students. Does he not realize that many teachers could use such powers to wreak havoc on innocent children ? And what next ? Will such powers also be granted to the Police to ‘lose their temper and beat civilians’ when the occasion demands ? Why not ? Of course, we should not forget the Offsprings of VIP’s who ‘lose their temper and destroy public and private property’, should we ? He is absolutely wrong! There is no excuse for a teacher to lose his or her temper. I also think the Rajapakses had similar excuses for soldiers losing their temper and spraying civilians with bullets. It is a very small step from the Sirisena position to the Rajpakse position. This Sira is a total uneducated villager who knows nothing what a sad situation for Srilanka. i agree a certain degree of capital punishment is neccessary. if you had visited government schools in US/UK the decipline is not there.no wonder the general public in states and uk are so un-couth. the rich in those countries send there children to private schools, where capital punishment is enshrined. most drug addicts and guys who end up in jail are the products of public schools in the US/UK. some are called charter schools for low income groups. teachers are abused,drugs a plenty. no education at all. countries who have done well in STEM – China/Russia/Korea/Japan all have capital punishment in school- be it cain/doing dips/ going and standing in the corner ..
Agree, on the whole “jehan”, but NOT to CAPITAL punishment; you meant “corporal” – which we received! But I’m glad it’s almost gone, from the more enlightened “Independent Schools”. But yes, you will see that I, too, have received flack above for trying to see from a teacher’s perspective. And THEN, comes DAHAM! For him, not psychiatric treatment, NOT corporal punishment – to start with. Psychiatric treatment, and that urgently. Let us see. Not many will respond to me with a comment, but they will give us both many “thumbs down”, without seeing how contradictory such an attitude is. THEY will respond with anger, not with understanding. Sorry, typo in 3rd paragraph above: a pretty obvious one. Please disregard the first “not”.